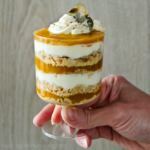 Mini pumpkin trifle is an easy pumpkin pie in a glass, which is great for Thanksgiving or any other celebration, when your oven is busy. This is a great no bake fall dessert, decorated with homemade caramel candy. Layer a small tray with parchment paper. Put pumpkin seeds on parchment paper in one layer, 1 inch one from another. Don’t make it too smooth. In a heavy bottom clean small pot put sugar and water. Put the glass lid on a pot. Heat on a low, wait until sugar starts to change color to golden (no mixing needed). Watch it like a hawk, it may take up to 15 minutes. When your caramel is golden brown, pour it over pumpkin seeds and let it sit until it sets. Blend or mix pumpkin puree with spices and sugar. In a cold bowl, whip heavy cream with sugar until stiff peaks, about 6 minutes. Put whipped cream in the fridge. To assemble, put in layers (use piping bag or teaspoon) – crushed biscuits, then pumpkin puree, then whipped cream like on photo. Repeat until you have the last pumpkin layer. Pipe whipped cream on top, add pinch of crushed biscuits around. ** Choose most beautiful peaces. You will have some leftover caramel candy.